The Olympus Tough TG-5 is arguably the best waterproof camera available today. It boasts a wide variety of features, including the ability to add lenses as well as record 4K video. We took the TG-5 out and about about in wet and rugged environments fishing, swimming, paddle boarding and tubing, and the new Olympus Tough TG-5 performed well. Here is what we learned. The Olympus Tough TG-5 is waterproof, dustproof and rugged. You can drop it, sit on it, throw it in a duffle bag and treat it poorly and it will keep working. If you leave it in sun for a few minutes, it will still work — unlike typical smartphones that quickly overheat and shutdown. You can hold it underwater and film the release of a big trout or take video of a kid jumping into a pool in a swirl of bubbles and chlorinated water at the local water park. If you drop the Olympus Tough TG-5 in a mud puddle, you can wipe it off with your t-shirt and shoot video like nothing happened. 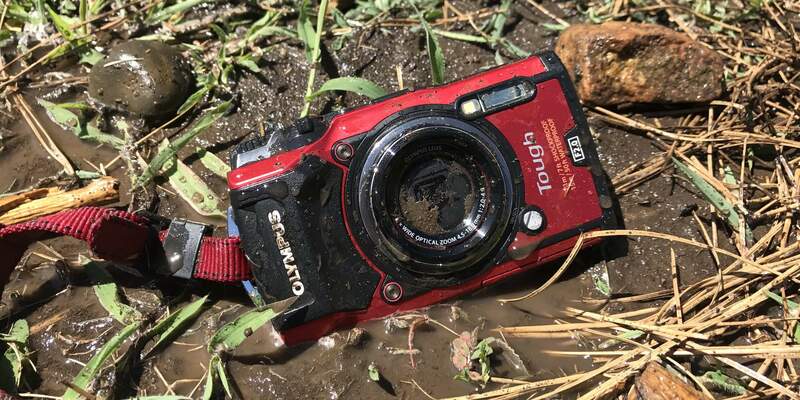 The Olympus Tough TG-5 camera is waterproof and rugged. Just rinse it off and you’re good to go. 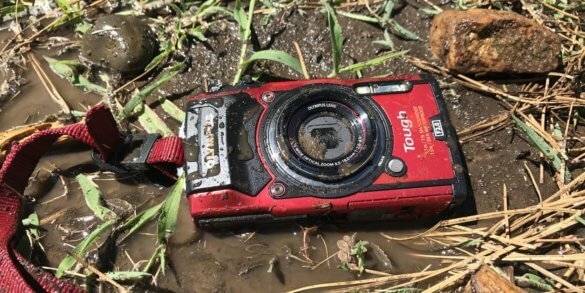 If you need a rugged waterproof camera you can abuse, the Olympus Tough TG-5 is a great starting point — and it tops our list of the 7 Best Waterproof Cameras available in 2017. 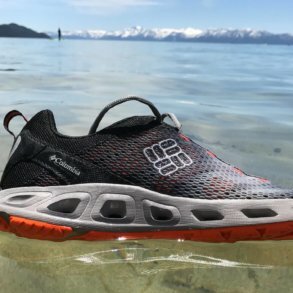 Let’s get the basic specs out of the way: It is waterproof down to about 50 feet, shockproof to drops up to 7 feet and crushproof to 220 pounds. It’s freezeproof to 14°F. 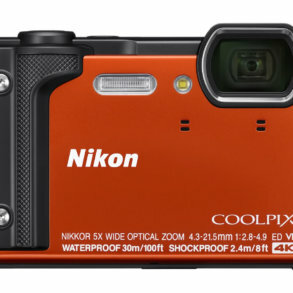 It has an anti-fog lens that helps reduce fogging when you use the camera in cold water and then remove it to use it in warmer air. It has Sensor Shift Image Stabilization, built-in WiFi, built-in GPS, a 12 megapixel sensor and a high-speed f2.0 wide angle lens. It shoots Ultra HD 4K video up to 30 frames per second and shoots great 1080p HD video at 60 fps. And it will shoot RAW photos, which is particularly handy for more experienced photographers who like to use software to enhance, fix or modify their photos back at home. 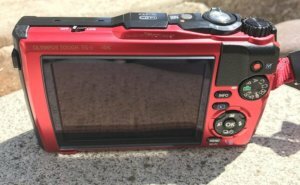 Olympus Tough TG-5 Review: Better Than Your Smartphone? The Olympus Tough TG-5 has a 4x optical zoom lens, which is one of the key reasons why the TG-5 could be better than your smartphone. I’m generally happy with my iPhone, especially when I pair it with a LifeProof rugged waterproof case, but it isn’t as capable in recreational conditions as the TG-5. First, my iPhone has lackluster zoom capabilities. When you need to zoom in to get closer to the action, the 4x optical zoom in the Olympus Tough TG-5 is suddenly the difference between being able to see the subject and just seeing a tiny blob in your video. Note the dedicated red video button on the back side — it’s very handy. Second, smartphones need to do everything — they need to be communication devices, especially in emergencies, so running down your smartphone battery in outdoor environments means you might not be able to call for help when you need it most. In addition, sometimes smartphones don’t react as well when their screens are wet or your fingers are wet. The last thing you want on an outdoor adventure is to miss your action shots because your fingerprint reader can’t understand what wet wrinkly fingerprints look like. 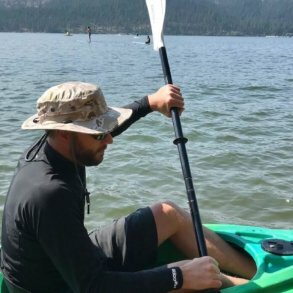 Worse, if your buddy picks up your smartphone to take a photo of you repeatedly falling on a stand-up paddle board, you’ll have to shout your passcode out to him first. In contrast, most anyone can pick up the Olympus Tough TG-5, turn it on and take a photo quickly and easily. The end result is that you’ll get more photos and video if you use a rugged camera than if you rely on a smartphone alone. The previous generation TG-4 was pretty good but it didn’t shoot 1080p video at 60 fps — and it certainly couldn’t shoot any 4K video at all. The new TG-5 is much better at video. Is the video as good as you’ll find in the GoPro HERO5 Black? Yes and no. If you need to zoom in to see some wildlife critter, then the TG-5 is better. If you’re looking for sweet action video with lots of video sizes, frame rates and great slo-motion capabilities, the HERO5 Black is better. Choose the HERO5 Black if action video is your priority. Choose the TG-5 if photos are your priority but you want decent video options. So what about the new processor? Olympus made an interesting choice: The company actually reduced the megapixels from 16 million down to 12 million. Crazy, right? Maybe not. It’s notoriously hard to get all those megapixels to capture accurate light through small lenses quickly. In addition, Olympus changed the processor to its TruePic VIII Image Processor, which is the same processor used in the high-end Olympus E-M1 Mark II camera. Olympus says that these changes bring better overall photo quality and better low-light images. The Olympus Tough TG-5 starts up fast. Note the on/off toggle switch for logging GPS data. Through real-world use, the Olympus Tough TG-5 images are pretty darn good. 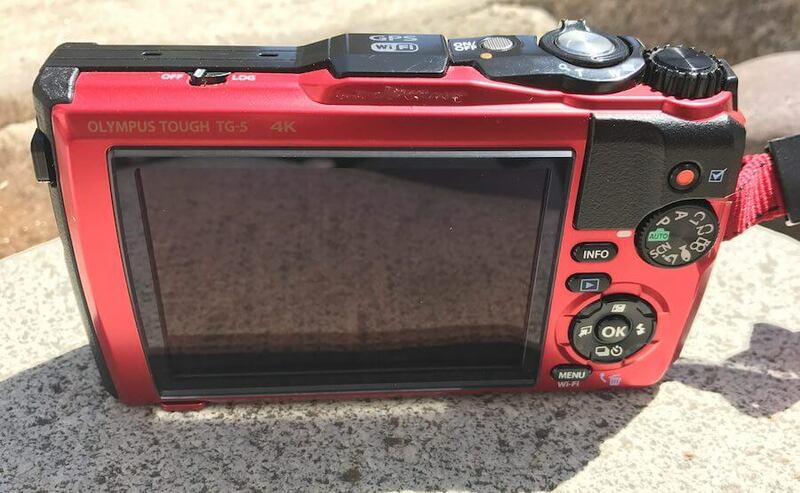 They’re not as good as you’ll get with most any modern larger-frame camera, but remember, the whole point of the Tough TG-5 is waterproof ruggedness in a small and handy package. At the beach in great light, they compare well to an iPhone 7, which has a great built-in camera. In low-light conditions, the iPhone 7 seems to do a better job — but you should know that Apple and other smartphone companies have spent very large amounts of money making sure that people can take photos of their food in dimly lit restaurants as well as night-on-the-town selfies and still get good results. I think of my smartphone as a versatile tool and my TG-5 as another sort of versatile tool. But back to the beach. I was primarily curious as to the video quality of brightly colored float toys, swimsuits and splashing water at 1080p at 60 fps — would it be as good as a similar video on an iPhone 7? While I didn’t set up a side-by-side test for this, subjectively, I’m very pleased. You can zoom in 4x and get great results. Furthermore, when you download the Olympus OI.Share app and connect the app to your TG-5 camera, then transfer video to your smartphone, you now have the photos and videos on your smartphone, either as a backup or to edit or share. My only video quibble is that you can’t shoot 1080p at 120 fps with audio. Sure, I would rarely want to bother with the larger file size this would result in — and I almost never use it on my smartphone even though I can — but it would have been nice for some action clips just for fun. Of course, you can shoot high-speed video clips in the High Speed Movie mode at 120fps at 1080p or 240 fps at 720p but the audio is left out, which, if you want slo-motion, you’re going to lose the audio anyway. Like I said, minor quibble. 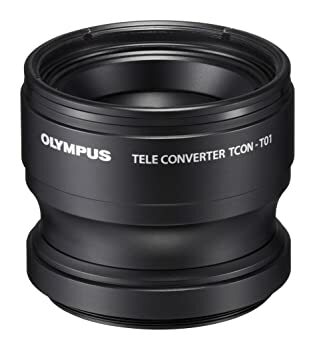 The Olympus telephoto lens increases your TG-5 zoom. The Olympus Tough TG-5 claim to fame is its overall versatility. You can add a couple of key lenses to change the characteristics of the TG-5. A telephoto lens will boost your zoom to nearly 7x, and you can use a fisheye converter lens to give you an ultra-wide 130° field of view. Olympus also offers a Flash Diffuser and an LED Light Guide, which makes lighting tiny subjects much easier for macro photography. For a bit more protection from scratches, you can use the Olympus Silicone Jacket or dive deeper down to 147 feet using the soon-to-be-released Olympus Underwater Housing. We also like the Olympus TG-5 Sport Holder, which lets you create a camera holding/mounting point on backpack strap or belt. Our priority in any review is usually more about what the gear lets you do, helps you do or encourages you to do. 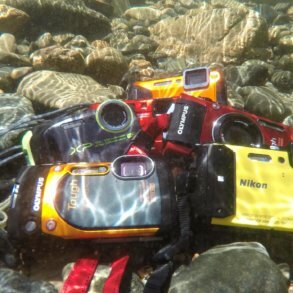 In this case, the Olympus Tough TG-5 encourages and lets you take photos in wet and rugged places, underwater or above ground. You can take it snorkeling or skiing or backpacking. 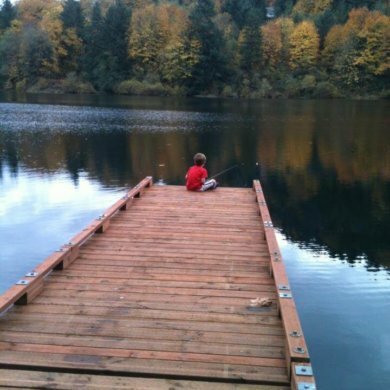 You can take it fishing or hunting or hand it to a kid and not worry if it gets dropped in the sand. If you like to get outside, this is a big deal. The Olympus TG-5 really shines here. Compared to rugged point-and-shoot waterproof cameras, the Olympus Tough TG-5 starts up astoundingly fast, making it ready to shoot photos or video quickly. I never once felt like I had to wait for the camera to start up. The photo quality is fantastic for this class of camera, and the video quality is, too. The Olympus Tough TG-5 is a must-have adventure partner. If you’re into GPS logging and tracking your activity, the TG-5 uses Olympus’s built-in Action Track Sensors that can record your altitude, depth, and movement in the world. You can toggle this feature on and off with a dedicated switch. You can view and store the data using the Olympus Image Track app on your smartphone, as well as export stills and video with data overlays. In addition, you can use a smartphone as a remote control, which is handy for group shots in the backcountry or if you’re trying to frame and set up a cool low-angle photo, video or time-lapse shot. All-in-all, if you want a versatile, rugged point-and-shoot waterproof camera, it’s hard to go wrong with the Olympus Tough TG-5. Highly recommended.